DAYTONA Beach, Fla. – The two-car tandem appears to be here to stay. Just minutes into the second test session on Thursday at Daytona International Speedway, drivers were running in pairs, testing the new rules to see just how, where and how long one driver can push another. NASCAR’s rules changes – smaller radiators, smaller spoilers and a relocation of the grille opening to the center of the front bumper – are intended to limit two-car tandems, but they apparently won’t cut out the practice entirely. The new package does appear to be limiting how long the pushing car can remain locked onto the lead car. The interesting part, for now, is what NASCAR’s reaction to the speeds will be. 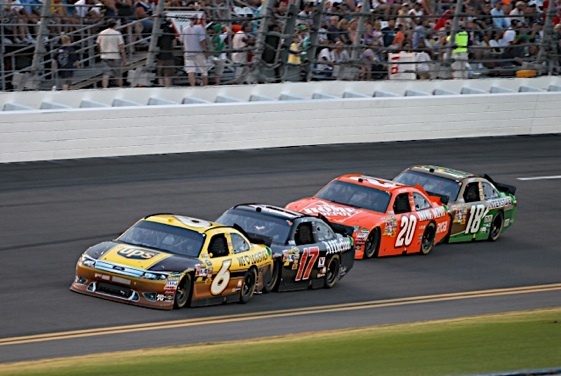 In single-car runs, drivers were about eight miles per hour faster than last year’s speeds, and Kyle Busch topped 200 mph running in tandem with Joe Gibbs Racing teammate Joey Logano. While many surveys of fans have concluded that spectators have become tired of the tandems, Danica Patrick questioned that line of thinking. “Is it true that fans don’t like it at all?” Patrick said. “I know I’ve watched some of the races that I’m not in, and I think it’s kind of interesting. Another change to the cars, the introduction of electronic fuel injection, appears to be a seamless switch from the antiquated carburetors, distributors and manual fuel pumps that had been on the cars up through last year. The cars seem to be starting up just fine, with no pumping the accelerator pedal and no sputtering and stumbling in the garage and on pit road. The tool boxes in the garage are a little different. There are no tools for adjusting carburetors, no sets of carburetor jets, no distributor tools or timing lights. All adjustments now are made via laptop computer to a control module that occupies the spot on the dashboard once held by the ignition boxes. Mark Martin said that while the adjustments to the EFI aren’t made in a traditional manner, they do offer lots of interesting possibilities. “I really do feel like there’s a crack in the floodgates,” he said. “I think there’s a huge a huge amount of electronics and adjustments and so much that can be done by the guys on the computer, instead of all those years I spent with Jack Roush and the carburetor apart in the trailer….